Top of the Bench Champions! 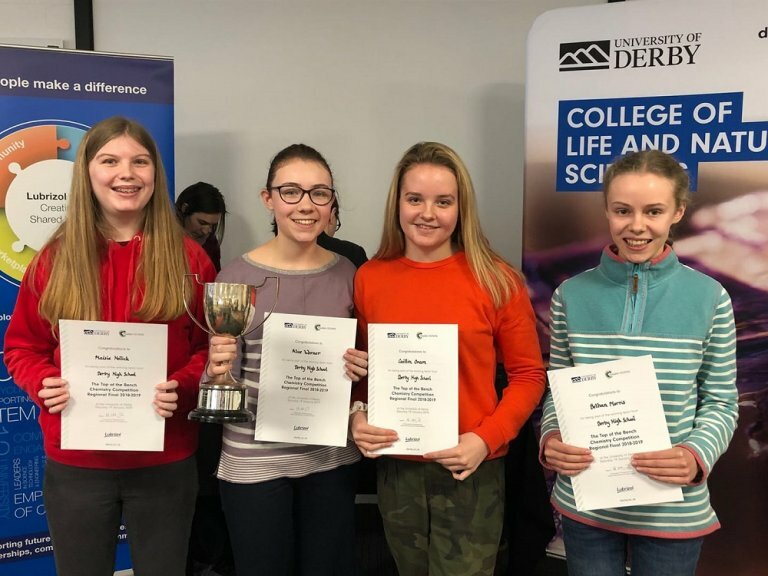 On Saturday January 19th, four of our chemists: Caitlin (U5), Maisie (L5), Bethan (U4) and Alice (U4) made the journey to the University of Derby to participate in the regional heat of the Top of the Bench Competition. This is a competition aimed at students in Years 9 – 11 testing both theoretical chemical knowledge and practical skills. The practical task gave the students the opportunity to work in a university laboratory trying to solve a real life engineering problem set by the speciality chemicals company, Lubrizol. The students worked hard as a team in both the quiz and the practical activity and so it was no surprise for us to discover that they were crowned Top of the Bench East Midlands champions beating off the challenge from 13 other teams. They will now represent the East Midlands region in the National Finals of the Top of the Bench Competition at the University of Birmingham in March.